Belén Fernández on the flip-side of U.S. military engagement. Could forces be creating their own enemies? Considering economist Robert Higgs’s estimate in 2006 according to which over 90 percent of U.S. public debt resulted from past military spending, it would seem that closing overseas bases and repatriating personnel would certainly not hinder economic recovery. According to the authors, the Asia-Pacific region is the next important host for the idea that "we simply cannot divorce ‘American’ interests from ‘global’ interests.” Of course, this region is no stranger to U.S.-led global stabilization programs, including ones that involved unleashing the equivalent of five Hiroshimas on neutral Cambodia in the 1970s. There is no doubt that the scenario proposed by Flournoy, Davidson, and their ex-employers in the defense establishment ensures the prosperity of highly exclusive sectors of the domestic population. 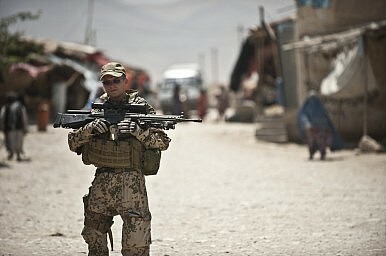 However, advocates for a reinforced military empire might do well to take note of former Financial Times journalist Matt Kennard’s forthcoming book detailing the present composition of the U.S. armed forces as a result of diminishing enlistment levels: Irregular Army: How the US Military Recruited Neo-Nazis, Gang Members, and Criminals to Fight the War on Terror. An empire cannot be sustained with grandiose turns of phrase, jingoistic cliché, or policies of worldwide military entrenchment that are ultimately self-destructive. In other words, advocates for imperial expansion might ask whether their proposed policies do not in fact hasten imperial decline. Belén Fernández is the author of The Imperial Messenger: Thomas Friedman at Work, published by Verso. She is a member of the Jacobin Magazine editorial board, and her articles have appeared in the London Review of Books blog, Al Jazeera, and various other publications. Even after a decade of war, Flournoy and Davidson argue that a forward-engaged U.S. military makes sense. Securing Syria's WMDUS Announces Suspension of Vigilant Ace 2018 Exercise With South KoreaMaking Sense of Russia’s Involvement in AfghanistanTrade Wars Are Not Good for the US Military AdvantageHow Does Japan View the US View of Preemption on the Korean Peninsula?